Sarkari Yojana » Central Government » Pradhan Mantri Jan Vikas Karyakram – Restructured MsDP Approved by Central Govt. Pradhan Mantri Jan Vikas Karyakram – Restructured MsDP Approved by Central Govt. 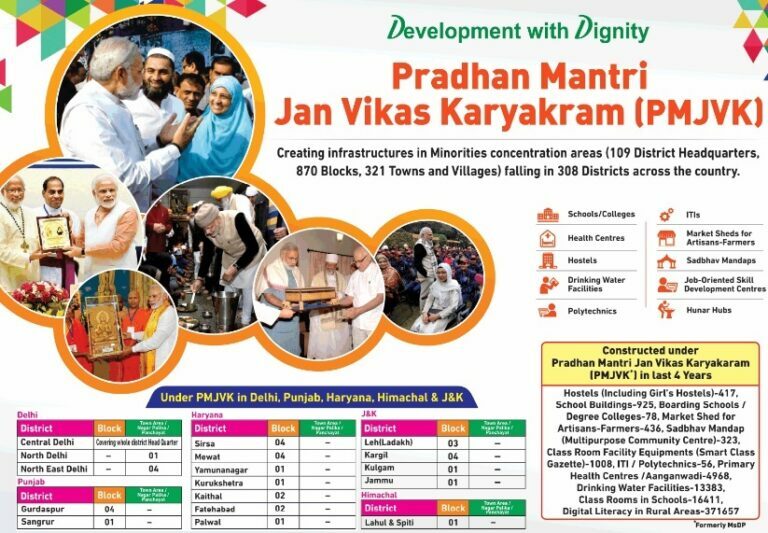 Cabinet Committee of Economic Affairs (CCEA) has launched Pradhan Mantri Jan Vikas Karyakram (PMJVK) for minorities. The meeting was presided over by PM Narendra Modi has approved and renamed existing Multi-sectoral Development Programme (MsDP) to PMJVK. This restructured MsDP would minimize the gap between national average and minority community on backwardness parameters. Now the central government will continue this new restructured MsDP scheme for the remaining period of 14th finance commission i.e till 2020. This scheme will provide better socio-economic infrastructure facilities to minority communities and enhance the coverage of scheme. Central govt. will implement this programme in 57% more areas of identified minority concentration towns (MCTs) and village clusters. MsDP covers 196 districts whereas PMJVK (restructured MsDP) will cover 308 districts across the country. Ministry of Minority Affairs will fund this entire scheme. PMJVK will now cover 5 more states and 61 aspirational districts having concentrations of minorities. Pradhan Mantri Jan Vikas Karyakram will now continue with a total outlay of Rs. 3,972 crore. Restructured MsDP will provide better socio-economic facilities to minority communities in the field of education, health and skill development. This would lessen gap between national average and minority community in accordance with the backwardness parameters. More flexibility would address important issues for speedy implementation which will result in inclusion of minorities. Around 80% of the total available resources will be utilized for health, education and skill development under PMJVK. Moreover, around 33% to 40% resources will be allocated specifically allotted for women centric projects. Govt. has rationalized the criteria for identification of Minority Concentration Towns (MCTs) and Clusters of Villages. Population Criteria – Govt. has now lowered the population percentage criteria of Minority community and fulfillment of backwardness parameters. Earlier, village clusters with at-least 50% of minority population were considered as MCT which is now lowered to 25%. Criteria of Backwardness – Previously, only those towns who are backward in both Basic Amenities and Socio-Economic parameters were taken as MCTs. But now, any town which is found backward in one or both of the above mentioned parameters will be taken up as MCT. Minority concentration areas are identified on the basis of population of notified minority community based on SECC-2011 Data. Highest number of districts under PMJVK (State Wise Distribution) are – Uttar Pradesh (43), Maharashtra (27), Karnataka (16), Bengal (16) and Rajasthan (16), Gujarat (13), Arunachal Pradesh (13), Kerala (13), Tamil Nadu (12), Madhya Pradesh (8), Haryana (7) and Manipur (7) and Punjab (2). Govt. will also include the most backward 61 most backward “aspirational districts” having concentration of minorities. This scheme will create infrastructures in Minority Concentration Areas (109 District Headquarters, 870 blocks, 321 Towns and Villages) falling in 308 districts across the country. — CCEA has approved Krishonnati Yojana 2018 for Farmers – Green Revolution in Agriculture Sector. — Central govt. will also continue Pradhan Mantri Swasthya Suraksha Yojana till 2020 to provide quality tertiary health care facilities.